horse | Chronicles of a "Mini-Pro"
I will admit that I have a demanding personality. I have high expectations of myself in terms of performance, commitment and excellence, and I tend to push these expectations onto those around me, including my horses. Sometimes this level of focus is an asset, but I am beginning to realize that sometimes I need to take a step back, take a deep breath, and let go. This fall, I had a less than stellar run of events with Annapony. We took August off from competition, but I noticed that even in training sets she wasn’t her usual willing self. I felt like when I asked for “more”, whether it was more impulsion, more roundness, more suppleness, more, her response was, “meh”. 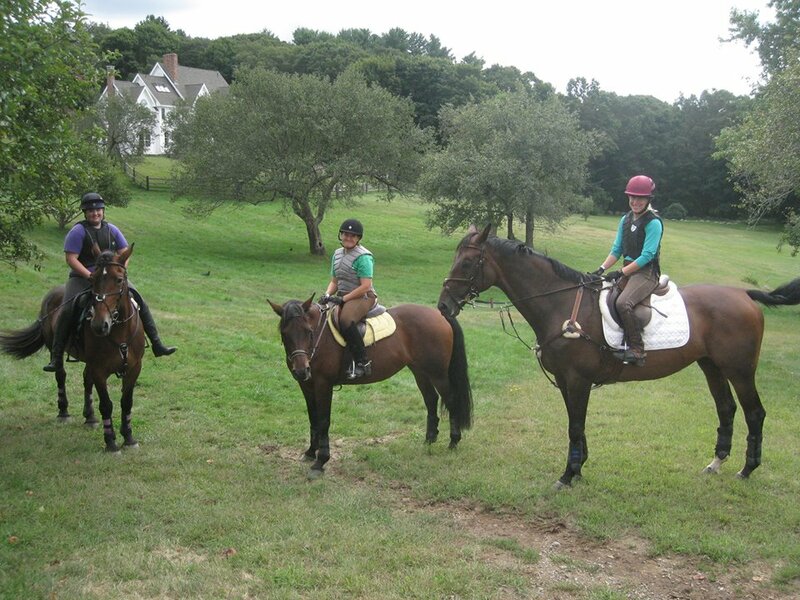 At the end of the month, we had the fabulous opportunity to clinic with upper level rider Kim Severson. But my pony was just not a willing participant, and Kim’s insistence that we repeat each exercise until it was fluid and forward just created frustration in me and resistance in Anna. I perceived that Kim didn’t think I was trying enough, but I felt like I was riding harder, not smarter, and my horse didn’t appreciate it. The next weekend, Anna was entered at King Oak, an event where last fall we had done just our second novice and finished on a 24.4. Dressage went great; I tried to stay elastic through the elbow, utilized counter canter in the warm up to loosen her topline and focused on keeping her forward and loose in the ring, and we came out with a 24.0. But stadium was a different story—she felt okay in warmup, but not outstanding, not like she was really taking me to the fences. In the arena, the strong wind that day was causing décor to ripple and flow, and Anna was uncharacteristically spooky. She startled at the judge, ignored my leg when I asked her to “go”, but in spite of this clocked around the first five fences. Then, abruptly, she refused at fence six. It nothing about the fence; her attention had left the ring and was focused on an eliminated horse/rider leaving the cross country course in front of us. I kicked her over on the second attempt, only to have her stop at the next fence, when her focus went to the undulating brush in the box beneath it. It quickly dawned on me that I had only one stop left—and the only remaining obstacle was the combination, which hadn’t been schooling well at home. I admit it—I rode into it half-heartedly, expecting the stop which inevitably came. I returned to my stall, secretly relieved that I wasn’t going to have to try to kick her around the cross country course that day. On the drive home that day, I wondered why this was all happening—I had been doing everything “right”, after all. I ride five or six days a week; each week a careful balance of work in the ring on the flat and over fences and work out in the open conditioning or hacking. My horses receive excellent feed, regular farrier/vet care, I have excellent coaching—why wasn’t it all coming together? I began making plans to scratch my final entry of the season for Stoneleigh Burnham, just two weeks away. I didn’t care about losing the entry fee; I couldn’t face the thought of being eliminated again and I didn’t see any way that anything else was going to happen. I found myself in the days after King Oak feeling angry. I mean, FirstWorldProblem here, but I was angry—angry that my horse had been eliminated, angry that I had felt like a failure not just at the event but at the clinic the week before, and angry that I felt I was working so hard but spinning in circles like a hamster on her wheel. Needless to say, training rides were not outstanding in these days—I was unable to remain focused on what the overall horse was telling me she needed, and instead only concentrated on the fact that she wasn’t doing what I wanted. I wanted to scratch from SBS, but I also didn’t want to end the season with an elimination. I thought maybe if I could just somehow ride even harder, I could make it better in time. The week in between King Oak and SBS, three of us went schooling on our bay mares at historic Ledyard Farm in Massachusetts. Three different horses, three different goals. 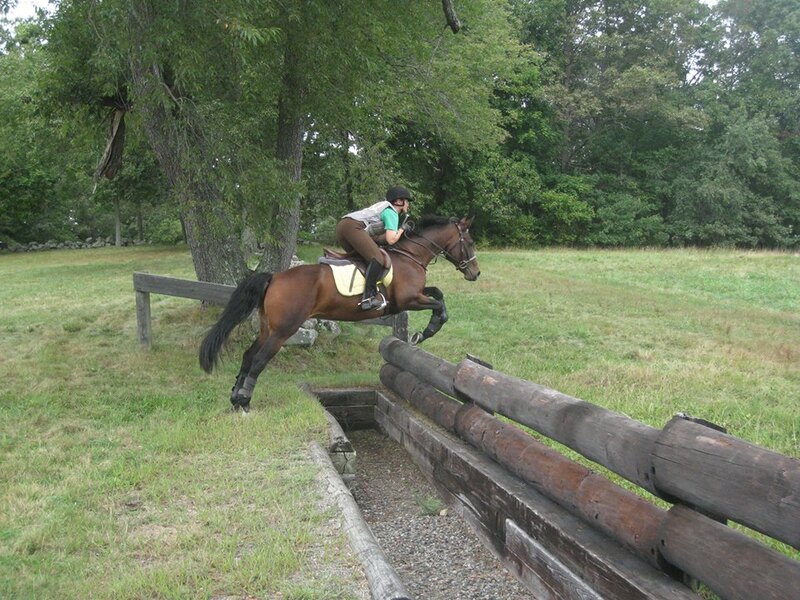 One friend was preparing to compete at the UNH Horse Trials at the end of the month on a talented mare that needed more exposure to ditches (the mare happily loped over the various Ledyard ditches with nary a hesitation); the other was prepping for the novice three day at Waredaca on her draft cross. And me—well, we were just trying to get our mojo back. Anna was a superstar nearly everywhere—she jumped coops, the trakhener, a ditch/wall, bounced up and down banks and drops without batting an eye. She begrudgingly dropped into the water and jumped out. But nothing with was done with a tremendous amount of fanfare—just enough effort to get the job done. Not a drop more. But even so, I started to feel a little better. Here was my sensible horse, the one who didn’t stop at fences she wasn’t scared of, the one who was willing to at least try. We were nearing the end of our schooling set—we had been on for over an hour—and our coach encouraged us to try a narrowish log fence between two trees. It had at one time been a more solid looking stone wall framed by the wood, but time had caused the definition of the fence to erode. No matter—it looked jumpable, and a good test of going a bit from light to dark. Anna drops into water just before the “mishap”. Note my excellent facial expression. I went first with Anna. Or I should say, attempted first. She headed to the fence willingly, but as we came to the takeoff zone it was like she suddenly couldn’t tell where the fence was. 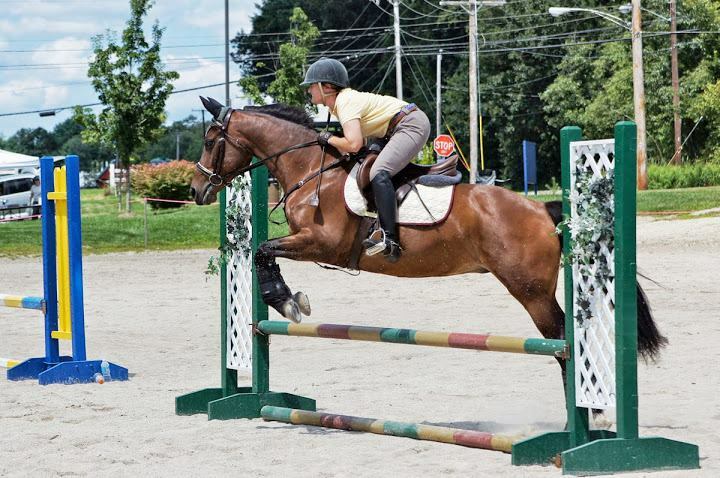 She scrambled a bit, ending up kneeling on top of the fence with one front leg while the other was extended over it. She slithered back off the jump, but not without catching her hoof on a rock as she did so. Thankfully she was physically okay, but with that one mistake, my tentative feeling of confidence and fun evaporated. I felt like I had let her down by asking her to jump the fence, as though I had tricked her. In an effort to end with something more positive, we returned to a basic coop fence that we had jumped earlier, and she willingly jumped it. I knew I should be happy with that but I still felt like the whole ride had been undone by the one mistake. Perfectionism can be a horrible disease. Still, we headed off to SBS the following weekend. Stoneleigh Burnham is a place that holds a soft spot in my heart. I attended the Bonnie Castle Riding Camp there in the summers of 1989 and 1990; I rode in my first “A” rated horse show there, on SBS’s mount Fudge Ripple, and I still have the treasured 3rd place ribbon we earned in the Novice Equitation class. It is also where I had my first actual exposure to eventing, given that I was a hunter/jumper kid from upstate New York at the time. I was given the (I thought) privileged job of holding up the rope during the road crossing for cross country for the SBS summer event in 1990. I felt so important, because I had seen people doing the same job at the Olympics on TV. For various reasons, I have never been able to compete in the event there until this fall, and I at least looked on the opportunity to do so as a “coming home” of sorts. My goal for the event, to be quite honest, was just to finish. I had no expectations other than that, or so I thought. The courses looked straightforward and inviting, and I felt the energy of warm childhood memories invigorating me to ride assertively and confidently. Dressage is a consistent phase for Anna; while she occasionally pulls out scores in the 20’s, she normally lands between 33 and 36. Steady and consistent, but nothing flashy or extravagant. Her test felt willing and fairly fluid, good enough this day for a 31.0. Hey, at least I can do lower level dressage fairly well, if nothing else. 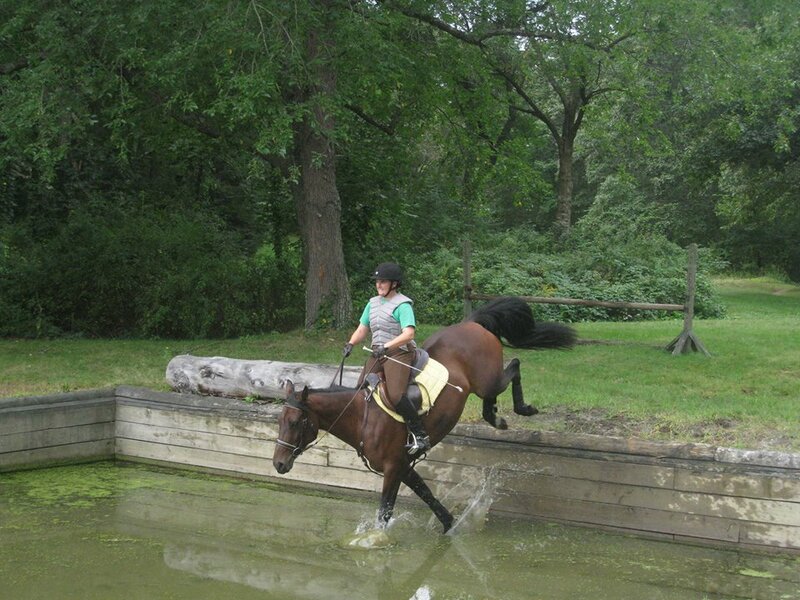 At SBS, riders show jump first and then go directly on to cross country. This format actually works pretty well for Anna, being the energy conservationist that she is. Enough time to catch your breath but not so much that you have to fully warm up twice. I warmed up for show jumping with a clear plan; she was to stay forward off of my leg, go through several transitions within gaits, and jump enough to be tuned up but not so much that the efforts became blasé. As my turn approached, the wind picked up again, a la King Oak, and I noticed that the taping which designated the show jump area was beginning to flutter and sway in the wind. “Great,” I found myself thinking. “Now she is going to spook at that.” But I quickly shut down the chatter (something I am pretty good at doing, in the moment) and instead acknowledged that it was a variable I was going to have to ride through. Anna and I made it around the show jumping course at SBS, but it sure wasn’t pretty. She took down two rails, both due to her being more attentive to her environment than to me, and had a stop at an oxer, again due to spooking. But unlike at King Oak, where the surprise of finding myself in that situation caused me to be slow to react, this time I was ready. I rode like a “crazy banshee woman”, an expression my students will likely recognize. In all reality, I overrode. But at that point, I didn’t care, so long as she jumped the d@&n jumps. I have to admit it didn’t feel satisfying to finish the course; I was embarrassed about having to ride that hard and that overtly and was vaguely grateful to not know many of the spectators lining the arena’s edge. I looked away from Judge Nancy Guyotte as I exited, too mortified by the ride to acknowledge that we knew each other. Anna and I having a fun time doing Daniel Stewart’s ‘playground’ exercise, July 2013 at UNH. Cross country was a similar story. Usually I can ride out of the box and pump Anna up, and she goes from there. But this day, I felt like I couldn’t take my foot off the accelerator for even a stride. She just never found her rhythm. She handled most of the tricky stuff fine, including a bigger/wider option ditch and some turning questions in an open field. But then, at a Helsinki, again, a stop. I had decelerated coming through the water crossing just before it, and failed to get the response to my leg that I needed coming up to the fence. I could feel the stop coming and simultaneously that nothing that I did at that point was going to matter. Still, I wasn’t going down without a fight. Whack, whack, whack. Kick, kick, kick. Whack, whack, whack. I knew my three slap rule and used it. On attempt two, Anna went over the fence (her issue was not with the fence itself, apparently), but I rode the rest of the course with one hand on the reins and one hand using the whip behind my leg off the ground. We came through the finish just one second below optimum time, my horse literally dripping with sweat on a cool September day. We had done it—we had finished the event. That was what I had set as our goal for the weekend, what I wanted to do. Or so I thought. 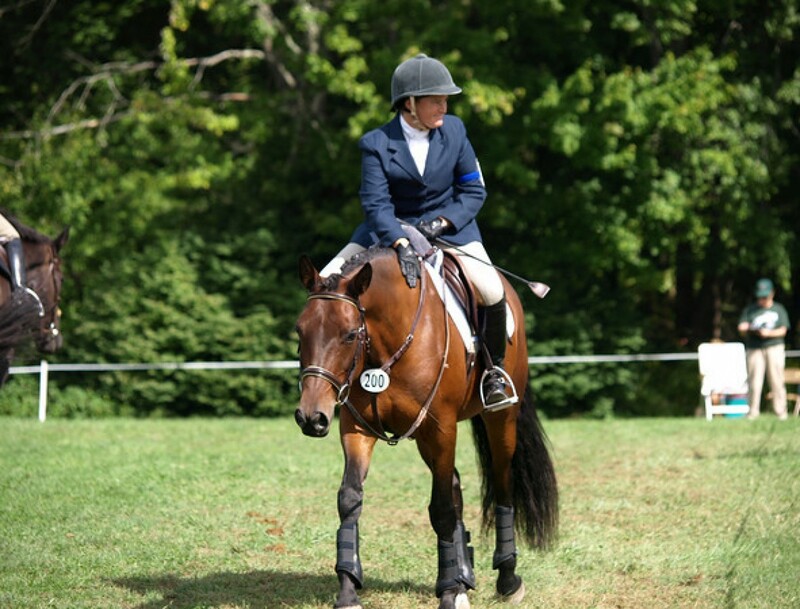 Because the truth is, even though we finished the event that day, it wasn’t a finish where I felt a sense of connection with my horse or a feeling of pride in a job well done. I felt as though she had done what I asked, begrudgingly, and that I had had to coerce her to give me the effort that she did. This is not how I want to ride or train, and this is not the kind of relationship that I have had with this horse for the previous three years. Our first ride– already a match! It was time to take a BIG step back and to re-evaluate. I realized that without a willing partner, reaching your goals is next to impossible. And more than finishing an event, or attaining the next level of competitive success, I wanted my willing partner back. This is a horse that, previous to this fall, has always been so willing to try, from the very first time I sat on her. 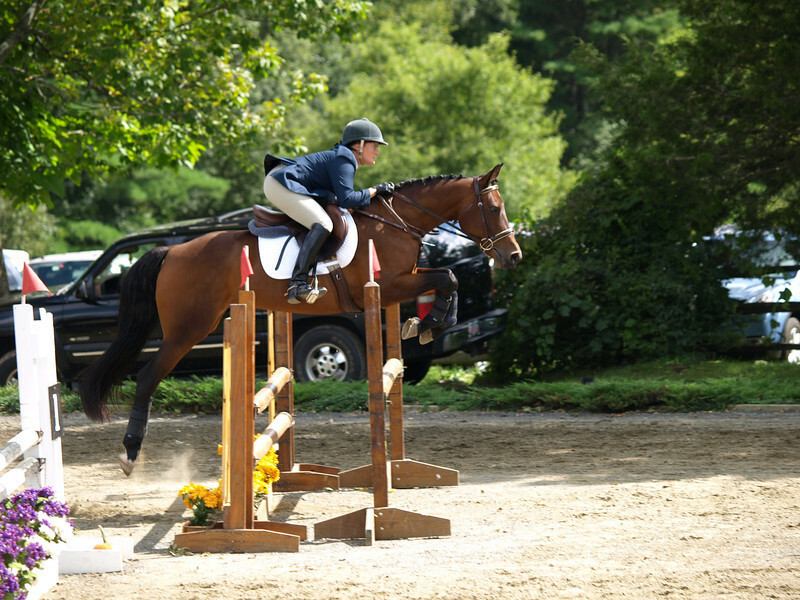 From her first jump in the arena, to her first cross country fence, it was unusual to ever have more than one stop at something, and then only if she didn’t understand the question. 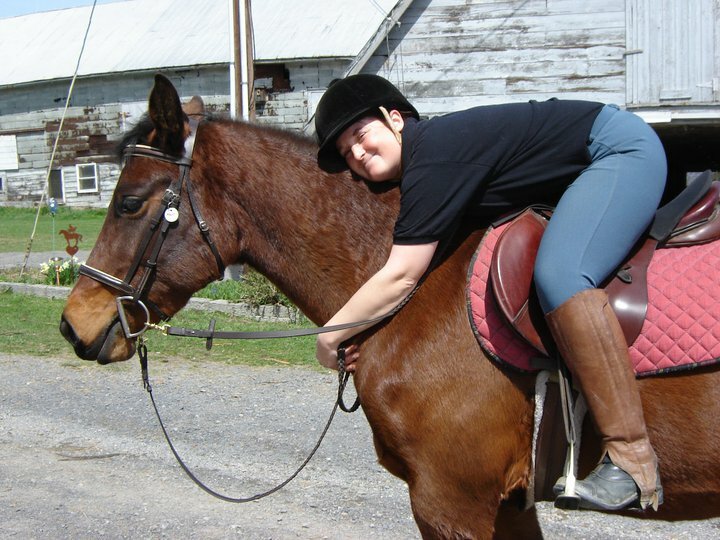 I looked forward to riding this horse each day more than any other horse I have ridden in the past few years, because she was just so much fun. Somewhere, we had lost that. I put away the spurs. I parked the horse trailer. And for the next three months, we mostly hacked, did some light ring work, and then hacked some more. Instead of riding with a “hard mind”, focused only on the end goal (I want to get my dressage scores down, I want to have her going solidly in Second Level work, I want, I need, I expect), I tried to think about riding with gratitude. With a sense of thanks— for how lucky am I to have the opportunity to work with this animal, to enjoy her presence, to hack through the woods and enjoy the local farmlands, to even have the opportunity to be upset that everything wasn’t perfect. These are privileges, and I needed to start paying more attention to what my horse was offering me than to what she wasn’t. With the onset of winter here in New England, we have begun our annual pilgrimage to the local indoor for training. Again, as much as having to hitch up the trailer to go ride every day is an inconvenience, I try to focus on gratitude, that an indoor right down the road is available for our use. This transition also has marked the start of a new beginning. I have been slowly increasing the workload, rebuilding muscle and trying to stay completely in tune with Anna’s mood and responses to the increased work. I am trying to respond to resistance not as, “I won’t” but “I can’t”; it is then for me to determine whether the cause is physical (she needs more strength or suppleness) or mental (I don’t understand what you want). I still can’t shake the thought that something was physically bothering Anna this fall. She grows an incredibly heavy and thick winter coat; perhaps metabolically while this transition occurs she feels lower in energy, and as a naturally quiet horse this makes mustering extra “go” difficult. So next year I will plan to clip her earlier in the season. Perhaps it has to do with her going into anestrous, though she is not a particularly ‘marish’ mare. I wonder if she tweaked a muscle somewhere in her topline or hindquarter, not enough to make her lame but enough to make her reluctant to go. So I moving forward, I will be doubly careful to ensure that she is well conditioned and work to bring her into the season with a higher level of fitness. But more than anything, I will try to remember that even though it is important, even essential, to have big goals on your ‘to do’ list, it is the day to day rides that make up the bulk of your relationship with your horse. “Riding with gratitude” will be my mantra for the 2014 season as I try to remember that being the best horseman I can be is not measured in the competitive arena but in the respect and relationship that I have with my horse.